The closed beta for Cataclysm, the third World of Warcraft expansion, may be about to begin. Blizzard began sending email invitations to members of the press, letting them know the beta phase is about to start. However, there was no fixed date announced. 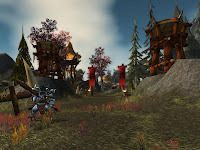 World of Warcraft: Cataclysm's launch is predicted for 2010, but no word about the time frame. It's likely that the closed beta will run for a few good months, anticipating a launch during the final quarter of the year.